My Mum is really good at birthday cakes. When I was little I had an ice cream cake, treasure chest cake, my name written in Smarties, a teddy bear, a princess cake and more over the years. So for her birthday this year, it was time to return the favour! 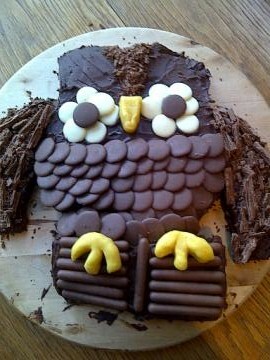 She requested this owl cake, purely for its cuteness, and my sister and I obliged.It took us a couple of read-through’s of the recipe to fully understand how the cake gets carved up into the adorable owl shape, and I may or may not have cut it wrong initially but that’s nothing a bit of chocolate buttercream gluing couldn’t save! It’s actually not too complicated to make, with a round sponge making the main body of the owl and then a square cake carved up for the rest. It was really fun to do something different and it felt pretty indulgent – chocolate cake, chocolate buttercream, marzipan, white chocolate buttons, milk chocolate buttons, Cadbury Flake’s and chocolate fingers all together, but hey, when better to indulge then a birthday? Especially when the result is this adorable. I don’t have any pictures of the inside of the cake as it felt a little morbid and also we didn’t use the original recipe. The suggested cake was made with melted chocolate and we wanted it to be a little bit lighter so used the chocolate version of this. The cake was huge when finished, and lasted a good few days, but happily it stayed moist even after being cut into lots of pieces. The link for the original instructions (with helpful step by step photos of the cake carving) is here – enjoy!! In American cooking, rhubarb and strawberries seem to be a majorly popular flavour combination. Here in England, its rhubarb and custard. Sharp bright pink rhubarb and creamy yellow custard – it’s definitely a strong rival to rhubarb and strawberry. Whether in two bold stripes in a hard boiled sweet, hot custard poured over a rhubarb crumble or both flavours combined together in a huge luxurious tart like today, it’s always a winner. I’ve been wanting to make a rhubarb and custard tart for a while now and had several different recipes saved in my ever expanding Sweet To Make file. I was reminded of this idea when I came across an amazing looking Custard Tart in the fabulous book Street Food Revolution but decided to save that for a special occasion due to the 12 (!) egg yolks it requires. I eventually chose a John Torode recipe, because surely the co-juduge of Masterchef will have trustworthy recipes (and also something in me always trusts BBC Food recipes). It also was not extravagant with eggs, seemed simple and intrigued me as to how the 300ml of double cream would ever set into a firm filling. But I needn’t have worried, it all turned out ok. More than ok! This tart was so good. I seem to be loving the mix of tart and creamy flavours at the moment, first the pannacotta, then this combination of the rich custard and vanilla poached rhubarb that still has a hint of its sharpness. I know it’s a bit past the rhubarb season now as I made this a few weeks ago, but I didn’t want to let a whole year go by without posting this. You never know, some lucky people might still have some growing or have been clever and frozen some for the winter. If not, I’m sure the combination of raspberries or blackberries with custard would be just as delicious. Enjoy! Note to self: don’t try and transport panna cottas. It proves rather stressful. I had to transport these, precious glasses and all, on a car journey to my Granny’s as I was providing the dessert at lunch. They were placed in a shoebox, wrapped in tissue paper, padded with tea towels and strapped in to the car with a seatbelt. Probably unsurprisingly, they and the precious glasses got there unharmed but perhaps next time I’ll stick to cake! I was inspired to make these after having these from M&S and loving the combination of rich creamy panna cotta and bright raspberries. I’ve made a vanilla pannacotta before, so I chose to combine the two layers of the supermarket version into one delicious raspberry panna cotta. I was nervous this would be too bouncy and jelly-like in texture because of the two sheets of gelatine, but I needn’t have worried as they set nicely but still stayed delightfully creamy and rich. The results were summery, absolutely chock full of raspberry flavour and a really pretty shade of pink. The recipe is from Nigel Slater’s fruit volume of Tender, but it can also be found here. You don’t taste the rosewater, it’s just there to stop the raspberries being too tart, although I suppose you could up the amount to make it a key flavour but I wanted to let the raspberries shine on their own. Enjoy!